Creating deep harmonies in the long nights of December, Kitka brought its Wintersongs concert to the Bay Area this past week. 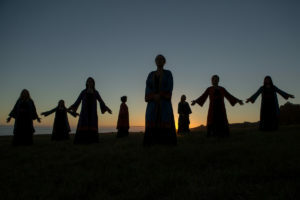 Although it makes its home in Oakland, this women’s vocal group is internationally famous for its explorations of the music of Eastern Europe and Georgia, and they have been creating fresh arrangements based on ancient scales for the last 39 years. Friday night’s program, Dec. 15, at St. Paul’s Episcopal Church in Oakland, was also a celebration of their latest CD, “Evening Star,” and explored women’s vocal writing from pre-Christian Balkan and Slavic traditions all the way to modern Russian and Yiddish prayers. The power of the drones and harmonies was a constant thread through that journey, as was the language, which slowly changed over centuries to encompass new deities and religions. And so the pre-Christian winter god, Koljada, may have been related to the Greek Kalenda, the beginning of the calendar, and the source of Koleda, the Bulgarian name for Christmas. And the evening star, Zvezda Vechernica, was also formerly the goddess who closed the rooms of the sun and opened the doors of night. An usher worked her way up the center aisle of St. Paul’s, stopping to light each candle until there was a river of living lights in the dimness of the church, and then the members of Kitka made their entrance from the back. Soprano Erin Lashnits Herman led them in “Kak Na Recke, Na Jordane,” a Ukrainian song that blesses the evening and the health of the people, as it describes the washing of Mary’s robe in the waters of the Jordan. Long-time members Shira Cion and Janet Kutulas added powerful drones and the others took the harmonies, as they paced their way to the front, turning from side to side to bless us and welcome the night. Their next song was V Hospodaron’ka, describing “three candles on three tables”: the sun, the moon and gentle rain on the fresh grain. The call and response on a minor scale slowly thickened in harmonies until these clear voices shook the large space. There followed three songs on the Evening Star, Bulgarian songs with soaring melodies and teeth-jarring harmonies. Boza Zvezda was a medieval prayer, a duet of alto and mezzo with lots of deeply resonant fifths and tight seconds. Koledna Zvezda alternated two trios with gentle half steps and low harmonies for a sound that was so direct it could stop one’s breath. Their sharp chromaticism was at odds with the tight thirds of their harmonies for a sound that bit and soothed at the same time. And Zvezda Vecernica showcased an ornate soloist who soared over deep drones. Her melody rose to a perfect fourth and then dropped back to hover on the second for a tight discord. When she rose a half step into major the resolution was both satisfying and oddly disconcerting, as our ears were already tuning themselves to the minor. Two songs from the Caucasus Mountains followed. In K’viria a throaty alto was enveloped in a hum of gentle harmonies, heartfelt chords that slowly moved past each other. And Mze Shina Da Mze Gareta was a slow chant for trio that sent us dreaming. From dreams we turned to Yiddish lullabies, with sad texts that were witness to centuries of persecution. Erin Herman, Caitlin Austin and Shira Cion were the soloists with a delicate melody as the others created a shroud of quiet hums. “Ay-de, lu, lu, lu. Like a wild dog you’ll be chased away from doors and gates…and the Messiah will sit upon a stone and beat upon himself,” they sang with the slow regularity of a cradle. They returned to wilder polyphonies and clarion voices, with Kristine Barrett winging rich notes out to the back of the church, and Shira Cion and Janet Kutulas anchoring with pedal tones. Kelly Atkins, Caitlin Austin, Lily Storm and Hannah Levy all helped build thick chords and knife-edge unisons, and each clear high voice took a turn in the solos. In addition to this group’s careful research and mesmerizing arrangements, it was clear that this is a group of the highest talent. These voices, open and sustained and without any vibrato, were uncovered and bright to the point of sounding nasal. These were the deep sounds of a powerful diaphragm and an open throat, the “chest” voice. And when they lingered on buzzing thirds or sharp dissonances, we heard a note that was pain and beauty mixed tightly together. In a change from the bite of their tight dissonances, there followed an eight-part cloud of sound that would indeed soothe the ailing. The melody took small steps and a regular structure, as if to promote a deep and even breath, and returning our focus to our own inner harmonies. After healing came a blessing, and that is as it should be, and that somehow grew to include us all. The Beatitudes (or Zapovedi Blazenstv) is a modern composition of eight blessings by Vladimir Martynov, and arranged by Kitka member Caitlin Austin. She and Lily Storm traded the slow, reverent solos, while the others built a formal 1-3-5 major chord as the drone. And after blessing the meek and those who weep and those who thirst for justice, they sent us into the night feeling renewed and thankful, with a brightly shouted Alilo (Alleluiah), a full voiced song of thankfulness. These performers are renowned for good reason, and we are lucky to have them in our own backyard. Photo of members of Kitka in the westering sun, photo by Tomas Pacha.